Diamond beach is a mysterios nickname, where ice floes from the Glacier Lagoon are beached by the high tide. If you are used to diamonds with just millimeters in diameter, you can com here to experience glacial diamonds with meters in diameter. But unlike the real diamonds, the life expectancy of these ice diamonds is really short, just hours. 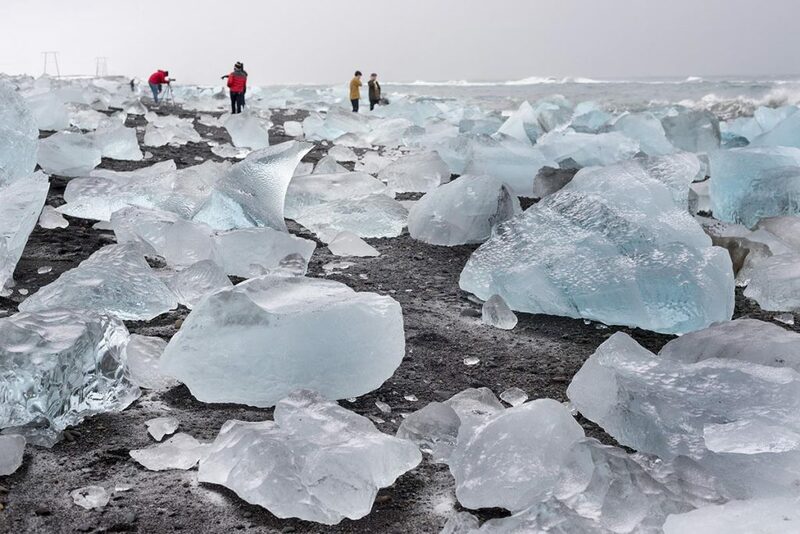 If you are about to ask a natural born Icelander about the Diamond beach, he (or she) won´t probably have any idea of what are you talking about. Similarly like with the Golden circle, Diamond beach is just and only marketing name and has nothing to do with Icelandic history. The Icelandic name of the Diamond beach is Eystri- or Vestri-Fellsfjara, depending on which side of the Jökulsá (river) you’re on. Diamond beach is located in close vicinity to the Glacier Lagoon. If you want to come here from there by walk, you can go along the Jökulsá river under the brighe, so you do not have to cross the road. You can find the Diamond beach on both banks of the Jökulsá river. There is a spacious parking lot with toilets where you can park your car. GPS coordinates of the Diamond beach: 64.043065, -16.175841 Take me there!